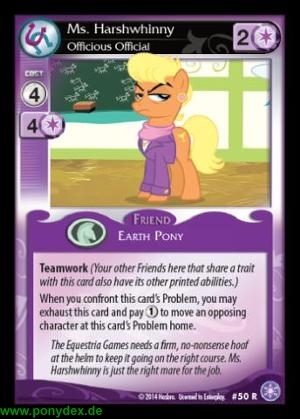 When you confront this card's Problem, you may exhaust this card and pay 1 action token to move an opposing character at this card's Problem home. The Equestria Games needs a firm, no-nonsense hoof at the helm to keep it going on the right course. Ms. Harshwhinny is just the right mare for the job.